'I learnt about dentistry from that' What an excellent idea; How I wish someone had come up that while I was still in practice. 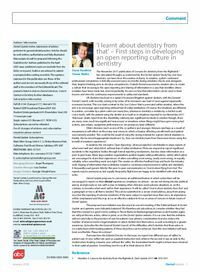 Abstract: The November 2017 publication of ‘Lessons for dentistry from the flightdeck’1 has stimulated thought, as evidenced by the Dental Update Study Day into how dentistry can learn from the aviation industry. In aviation, a pilot’s continued professional competence is formally assessed every six months during simulator checks and, alongside that, targeted training aims to develop competencies.